New Cycle of Ogham Study Group? Re: New Cycle of Ogham Study Group? As stated I have fallen behind. I am only now getting to grips with the Ogham script. Will see how long it takes to get through it!! What's the record for the longest time spent on this? OK, one thing another of the Ovates - one of the German women - Serpentina, helped me to realize, is that we don't all gravitate to the same ogham letters. I find the trees are more familiar to me than strange: but I often only know a few of their traits and it may only be during 1 or 2 seasons. Similarly, I feel that only when the temperature is above 50Fahrenheit, about 15Centrigrade and when the Sun is stronger than say...Samhain through Imbolc [this will vary with location] - its like, when their sap is running and it has rained recently and is warm enough that when a tree might "talk" to a human or animal. Otherwise they are too withdrawn. Even under the best circumstances most do not respond that much to the high speed fleeting motion of humans. One can see why it is easiest to make friends with a tree one lives near for decades. 'After the 100th time I started to realize that was actually you' might be how it is for the tree. I have taken small amounts of the flesh of a few local living ogham trees in the Spring and formed them into the ogham letters. I have found this to be freakishly slow going, but the futhark was also slow. I think its because ogham is a magical alphabet - meaning that there is a lot of meaning in each letter as a stand alone item in addition to the simple fact that it can be used as an alphabet to write words the way we are used to. Latin is actually 'different' from some other languages in that it was just made for writing things down - 'administrative, not magickal'. 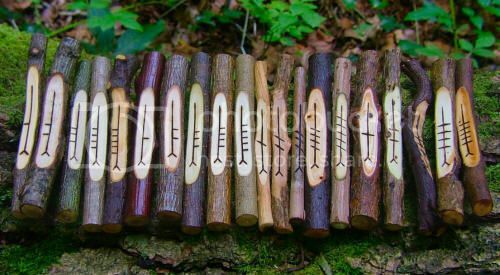 My favorite ogham might change depending on the circumstances but generally: I love oak, and birch and beech. I respect the ivy and admire the hazel and the willow. The thorny bushes are more foreign to me. I feel good but a little strange how true it is that not all the trees are ogham. What became of this thread, or the ogham study group? I wrote a book that could be used as a text for the study group. And could recommend some well researched material also that are real scholarly. My Druid focus is upon ogham as the foundation of all things druidic. Please respond anyone if interested. Ooh I'd appreciate a refreshing of the Ogham study group. I've been reading The White Goddess and have been looking a lot into the significance of trees. Kerdin || Bard in Training. Dyfal donc a dyr y garreg! Go to www.smashwords. com and search Ogham: The Fire in the Head. By Daniel Levie. Its my ebook on the initiatory values found in the sequence of the ogham itself. Its a novel approach, admittedly, using purely Celtic keys however for nothing but Celtic keys may unlock ancient Celtic wisdom in my experience. Read over the first few sections for free online. If you feel it's worth risking your money by all means pay the few bucks. You won't be disappointed, other than the typos that are rife all throughout for which I can but apologize. I am working on the updated version. I just wanted to get the draft out because I felt the oghamist in us all deserved to read what I had uncovered. I am excited to be part of an ogam study group.